In 2018, 65 million people were uprooted around the world. From Iraq, Bangladesh, Turkey and Northern Greece, this film tells the story of millions of men, women and children travelling thousands of miles to find a home. And yet the world seems to shrink. Today, people of dif- ferent cultures and religions must learn to live together. 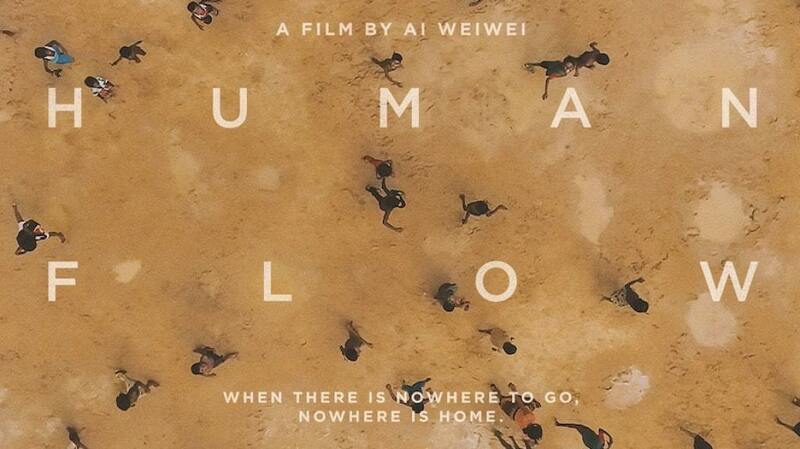 Ai Weiwei, the director of Human Flow, is known for being an artist within the independent Chinese art scene. Sculptor, performer, photographer, architect …as in his own life, his film transcends borders. In 2011, in the line of fire in Beijing, he was imprisoned for 81 days in degrading conditions arousing indignation around the world. This documentary remains more educational than revolutionary. The dissident artist offers a two- hour story consisting of extracts from a thousand hours of rushes (raw footage). More than 200 technicians in 23 countries contributed to the project to increase the scale of this crazy endeavour.